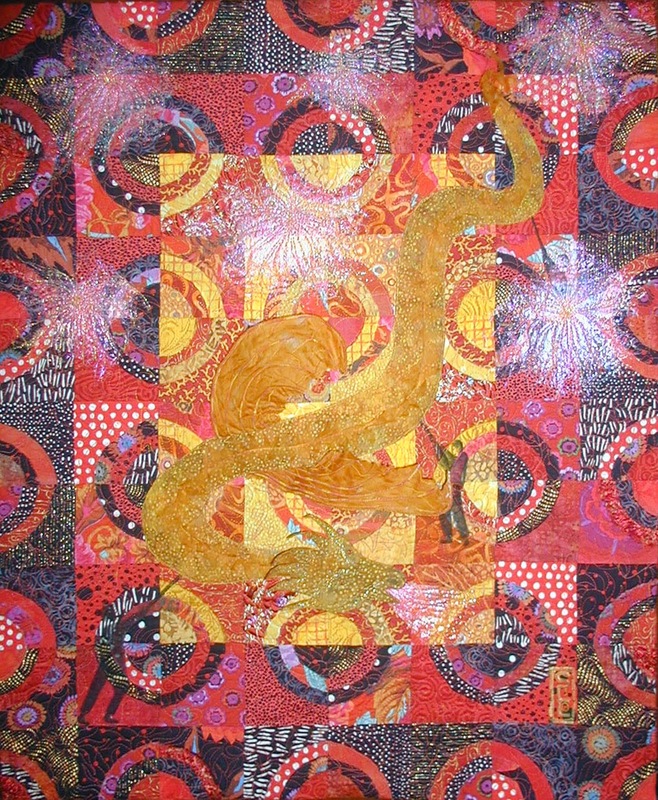 Rebel Quilter: Happy New Year! Here is a quilt very few of you have seen. It has been on tour for several years as a part of America Celebrates. My warmest thanks to Judith Trager who coordinated this display and handled all the logistics of traveling the show. From my experience in doing the same for Roots of Racism: Ignorance and Fear, I know what a monumental effort it is and how much time is taken away from one's own ability to create. Thank you, Judith. I hope you can now get back to your own lovely work. After I shot this image it was determined that the dragon would stand out much better with a darker shadow to lift it off the background. So it sports that now. My next project is actually a bed quilt. What? My younger son and his wife have been together for at least 12 years and somehow I never got around to making them their wedding quilt. You have to understand that I only make bed quilts for close relatives to celebrate monumental occasions...like births. I will still need to make 2 more to celebrate my 2 granddaughters. The timing of the wedding and their births sadly was such that my focus was on creating an income rather than creating for family. That element is no longer a driving force and their times have arrived. 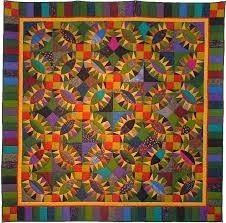 For the wedding quilt I plan to do a variation on a broken pickle dish. The arcs will be paper pieced....all 128 of them. Argh. Am I crazy? The initial request was to create it in Mexican fiesta type colors. I love the happiness these colors evoke. Especially during this extremely cold winter we are having in the Ozarks. I got as far as starting my prototype block only to be asked to hold off while a possible alternate color scheme is determined. So I am on hold. Since I have drafted the paper piecing, I was able to determine to my own satisfaction just how many peaks the arcs would have. There are easier ways to create this design but most looked like short cuts were taken. Even the version Kaffe Kassett did looked simplified. I do love his use of color. As with most bright colored combinations, the brights look best against dull colors so they can have contrast and not just be a riot of equally fighting colors. This is an image of one posted on Pinterest. It has somewhat similar coloration to the one I plan. Don't worry. I'll be posting the process as I go along. Happy News!!! 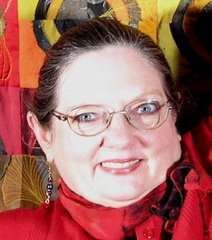 This week I'll be driving to Springfield, MO to once again join my troop of artquilting friends. It has been 3+ years since I was able to attend a monthly meeting of Uncommon Threads. I am truly thrilled to be once again connecting back up with this elite, outstanding, and exciting group of gals. They have been consistently supportive of all my creative efforts and my familial obligations as well. I am a lucky girl. We're the lucky ones, Susan! Can't wait to see you!